Jane Colden is considered the first American-born woman botanist. Born in New York in 1722, Jane was the daughter of Cadwalleder Colden, a successful Scottish doctor and scientist who moved to the Colony of New York in 1710. Cadwalleder Colden was an ardent Loyalist during the American Revolutionary Era and, despite his friendship with Benjamin Franklin, his political leanings led to his scientific work being largely ignored by Americans. Her father described Jane as having interest and ability in “natural philosophy or natural history” and he inspired and encouraged her work. Cadwalleder Colden had been the first to apply the system of botanical classification developed by the Swedish botanist Carl Linnaeus (i.e., Linnaean Taxonomy) to an American plant collection and he translated the text of Linnaeus’ books into English. Her father taught the Linnaean System to Jane and she superbly applied it to her own studies. 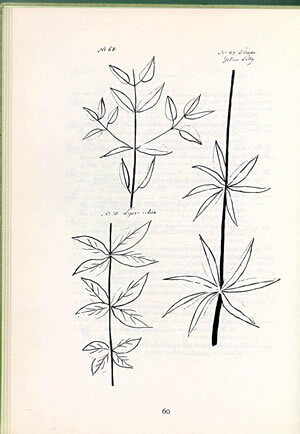 Jane collected, classified and described plants near her home of Montgomery, Orange County, New York. She completed more than 300 line and wash drawings of the plants. Jane also described their medicinal use and administration by the local residents. Jane Colden was widely admired for her scientific studies by some of the leading botanists and scientists of the period, including horticulturist Peter Collinson (1694-1768), botanist Alexander Garden (1730-1791 – the “Gardenia” is named in his honor) and naturalist John Ellis (1710-1776). Collinson, Garden and Ellis were Fellows of the Royal Society and pleaded with Linnaeus to name a plant after her. However, despite this prestigious and influential support, no plant is named in Jane Colden’s honor. Jane married Dr. William Farquhar in 1759 and died during child birth in 1766. During the Revolutionary War, Jane Colden’s notes and drawings were rescued by a Hessian military officer. Colden’s work was taken to England and now resides in the British Museum.